This photo has come to Our Newhaven via a roundabout route so we're not sure of its provenance or who took it, but as it was around 60 years ago, I think it's time it saw the light of day on line! Hard to put an exact date on it but the Coastguard Station up on the cliff top is the old one, so late 50s, perhaps. Our Newhaven, via Derek Longly and a friend in the USA! This scene shows a car (registered in Worthing from the LPO 366 numberplate, I think) being loaded onto one of the three 'Dieppe Screws', the little cargo ships that plied the route year-round alongside the passenger steamers. Which one of the three? We can rule out the Brest, as she had square windows rather than portholes, but there is, as far as I know, no way to tell which of the other two, Rennes or Nantes, it is. Your car would be cradled into the hold of the ship, which would then sail for Dieppe in advance of your passenger steamer. By the time you arrived in Dieppe, your car should have been cradled off and be there waiting for you. 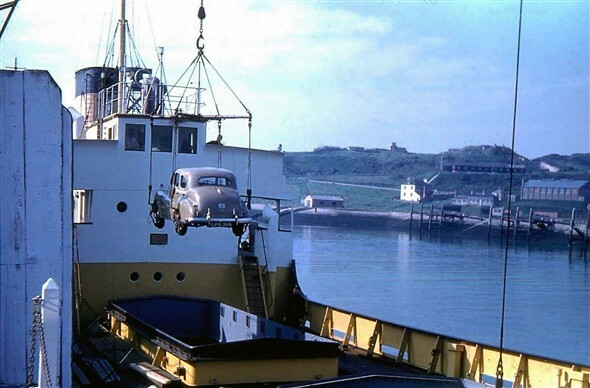 Quite a rigmarole and one that disappeared instantly in June 1964 when the Falaise started the car ferry service. But that rigmarole didn't stop motorists from travelling with their cars this way. Thousands did so every year. We do have black and white photos of the operations in Newhaven and Dieppe already on Our Newhaven, but this is the first time I've seen a high resolution colour image, albeit one that did take a half hour's solid work to remove the dust and scratches! Also seen in the image is the boathouse and slipway immediately down-river from the South Hard, and the large white building is the Master Gunner's House. This page was added by Andy Gilbert on 01/11/2017. The old coastguard lookout was still in operation in 1964, as my father was on watch there when I was born. He said it was quite a creepy experience being there at night. Does anyone know what the small boathouse and slipway was used for or who owned it ?